Color(s): All colors; Markings must be symmetrical. The facial mask is distinctly defined. 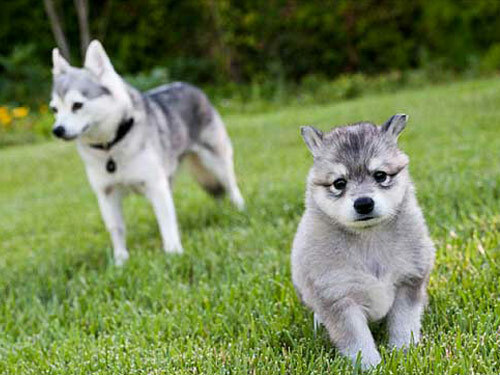 Developed during the 1970's in Alaska by Linda Spurlin, the Alaskan Klee Kai is a smaller version of the Alaskan Husky. Bred as companions, this breed is relatively new, having been recognized by the UKC in 1997. They come in 3 sizes: Toy, Miniature, and Standard. The Alaskan Klee Kai's most distinctive characteristic is the full facial mask. This breed is extremely loyal, affectionate with family, and active. Alaskan Klee Kai's are highly intelligent, highly devoted, and agile. They thrive on attention and companionship. The Alaskan Klee Kai is reserved around strangers and will alert by barking. They are also "talkers", emitting vocal sounds when they want attention. They do well with children and other pets they have been raised with. A double coat breed, the Alaskan Klee Kai has a well-furred appearance. Heavier fur is at the ruff of the neck and on the tail. They are average shedders and shed heavily twice a year. Early intense socialization is a must. This breed also does well in obedience. They require firmness, fairness, and consistency. The Alaskan Klee Kai does best with a securely fenced yard. They are excellent escape artists, so fencing must be set into the ground to prevent digging and tall enough to prevent jumping. They benefit from daily exercise and family interaction.